The Hall of Fame announced their 2017 finalists Tuesday, and once again, former Cardinals quarterback Kurt Warner has made the list. It’s not a surprise — Warner was close to making the Hall of Fame last year and it is expected to be just a matter of time before he is voted in. This is the third time Warner has made the final 15. Warner has said he would be patient with the process. The vote occurs Feb. 4, the day before the Super Bowl. The 15 will be whittled to a list of 10, and then as many as five — plus the possibility of the Seniors committee possibility, safety Kenny Easley, and contributors committee nominees Jerry Jones, the Cowboys owner, and former NFL commissioner Paul Tagliabue. “It’s always an honor. … Now you go into it and you appreciate the process, but you feel more than you’re not a Hall of Famer until you actually get the call,” Warner told NFL Network. The Pro Football Hall of Fame has whittled its potential 2015 class to 26 names, and included in there are a three major contributors to the Cardinals over the years. One is coach Don Coryell, who was the man in charge of the Cards’ teams of the mid-1970s that was successful enough that every time the current team hits a win plateau or streak, it seems to date back to one of Coryell’s squads. The other two are part of the Cards’ Super Bowl team: quarterback Kurt Warner, and running back Edgerrin James. James is probably a long shot to advance to the group of 15 that will be considered when the Hall selection committee gets together in Phoenix on Super Bowl eve to eventually name no more than five to the Hall of Fame. Coryell has got a better chance, I’d think, given his offensive innovations, especially coaching the Chargers in the late 1970s and early 1980s. Then there is Warner, who given his resume, figures to get into the Hall at some point. It would be fitting if that was this year — Warner’s first year of eligibility — with the class being named in Arizona. — He’s not headed to the Hall of Fame anytime soon, but Steve Keim has worked hard for a long time to reach his goal of being a general manager. If you haven’t yet, check out my story about Keim’s belief even as a little kid he’d end up running a team. The Cardinals would like to get an interception Sunday. That would be a start. It’d be a start in slowing the Eagles’ high-speed offense, and a start in taking young Eagles quarterback Nick Foles down a peg. Foles has thrown 16 touchdown passes in eight appearances (five starts and one other game of significant playing time), but has yet to throw an interception. It’s an impressive stretch for an inexperienced quarterback. The Cards are among the best in the league in getting turnovers. So maybe this is where Foles’ luck changes a bit. Profootballfocus.com said Foles has been under pressure on just 34.8 percent of his dropbacks. That makes life as a QB easier. Linebacker Daryl Washington said there have been times when Foles has thrown balls that can be intercepted. Sunday’s game might just turn on such a situation. — I’ve already touched on the Andre Ellington gimpy knee situation, but obviously, no Ellington would make a difference. Bruce Arians made the point it’s just one guy, but at this point, Ellington is the speed of this offense, the guy who can go all the way on a single play. His status Sunday has to impact this game, one way or the other. — The last time the Cardinals – winners of four straight – won five straight? That was back in 1977, when Don Coryell’s bunch won six in a row in a weird season when the Cardinals went just 7-7. The winning streak made their record 7-3, and they lost their final four. — The key to this game to me is Dansby and Washington. The two inside linebackers are playing so well, and when the Cards have beat the Eagles the last two meetings, Washington has been a major factor. With the Eagles’ speed and Shady McCoy running the ball, the Cards need big games from their inside men. — Just like Todd Bowles is having a redemptive season with the Cards after struggling with the Eagles, Eagles defensive coordinator Bill Davis is winning confidence after he was fired as Cards’ DC back after the 2010 season (with a stop on the Browns staff in between). — I don’t know if Larry Fitzgerald can get free as much as he usually does against the Eagles – Philly is of course running a different look than the Andy Reid years when they always seemed to let Fitz get loose – but the rise of Michael Floyd would seem to be incentive to watch Floyd much more closely. Which should help Fitz. — “As coach Buck (defensive line coach Brentson Buckner) always says, ‘You are remembered with the games you win in November and December,’ ” Peterson said. Here’s the Cards’ first chance in December. It’s kind of a big one too. After a while, even these endings tend to numb you. The Cardinals didn’t really do anything different than they have been. They won. Their playoff hopes took a blow when the Raiders couldn’t finish off the Lions in Oakland – the Cards need a lot of help the next two weeks, even if they win out, for the playoffs – but the goal at this point can only be a 9-7 record and let the rest settle out as it may. Let’s put this four-game winning streak in perspective, at least when it comes to me. I’ve never seen one. I started covering this team full time in 2000; the Cards’ last four-game win streak was in 1999. (I’ve seen a few four-game losing streaks, but I digress). — Props to Ken Whisenhunt’s 43rd win as Cards’ coach to set the franchise record and break his tie with Don Coryell. No, it’s not a Belichickian total, but it means something. It especially means something since it looked all but impossible to reach this season after that wretched start. — It’s still so hard to decipher QB John Skelton. Some great plays. Some plays he’s got to make. A stumbling offense, but a win. Good yardage – 313 – but a passing rating below 80 because he threw so many incompletions. Cards have won five of six he has played the majority of the snaps, however. “Everyone talks about Tim Tebow and his record but you look at John’s record and it’s pretty good too,” wide receiver Larry Fitzgerald said. — I will admit I was expecting a lot more Beanie. Skelton had 48 pass attempts and Beanie Wells just 15 rushing attempts (for 51 yards, so he is still six short of 1,000 for the season). Obviously the Cards fell behind, but against the 31st-ranked rush defense, it was surprising. — Safety Kerry Rhodes made his return, and showed up a couple of big times, one on a diving play to break up a deep pass, and another to take down a pass receiver short of a first down. “Getting back into the mix was a little weird, but no rust,” Rhodes said. — That’s @JayFeely, for those interested. And @LarryFitzgerald. — The field-position game started lousy for the Cards (obviously, since the offense couldn’t do anything) but ended perfect. Patrick Peterson’s big last punt return was huge, but it was helped because the defense forced a punt deep in Cleveland territory. — Thank goodness for the first turnover in three weeks. Only gave the Cards a field goal, but it was enough. — Cornerback Michael Adams said some on defense needed to “wake up” after that first Cleveland drive, but they did. Browns RB Payton Hillis had 51 yards rushing in the first quarter and still didn’t get to 100 (99 total). Christmas is coming. A winning streak — which the Cards will attempt to make five in Cincy Christmas Eve — is a fun gift for the whole family. — Former Cardinals coach Don Coryell, the most successful coach in modern Cardinals’ history before Ken Whisenhunt, passed away Thursday at the age of 85. The San Diego Tribune did a great story on Coryell, who will be better known for the aerial attack he put together for the Chargers in the early 1980s. But those Cardinals’ teams everyone has referenced the last couple of years — the 1974-76 squads that achieved double-digit wins in a 14-game seasons — were constructed by Coryell. UPDATE: Here is a story about Coryell’s years with the Cardinals. — Kent Somers has a nice piece on Deuce Lutui becoming a U.S. citizen tomorrow, timely given the controversy this state has seen because of SB 1070. Congrats to Lutui, who has been working on becoming an official citizen since 2001, something his father wanted. Unfortunately, Lutui’s father passed away last season, but Lutui made sure the dream came true. On a side note, Lutui declined comment on both his weight and contract situation. That’s what the Cards have been able to sidestep so deftly since the beginning of 2008. Last year, injuries were at a minimum and when they did hit the Cards, they were either short-term (Boldin’s face fracture kept him out only two games), were early enough to be sidestepped (linebacker Clark Haggans was out down the stretch and in the playoffs) or were apparently ignored (Kurt Warner’s bad hip). The offensive and defensive lines stayed intact. This year, it’s been a little tougher. Left tackle Mike Gandy went down and out, and it’s clear the Cards’ defense (and, on more individual scale, Adrian Wilson) was hampered by the loss of safety Matt Ware. As for the latest aches and pains, it’s the timing more than the injuries themselves, since being less than 100 percent can kill in the playoffs. Then again, the Packers are without a starting cornerback (Al Harris) and good pass rusher (Aaron Kampman) because of injuries, and it’s a non-story – because those injuries happened a few weeks ago. It’s football. You’re going to get injured at some point. Even the Cardinals. — The Cards must get off to a good start, for multiple reasons. They need to feel good about themselves, and that goes for every week. 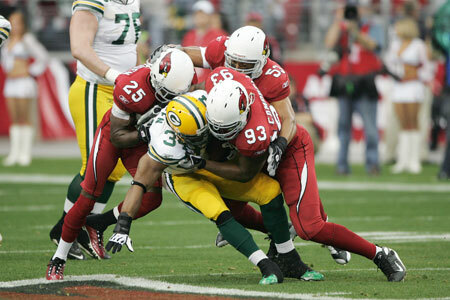 And while the first two times these teams met this year ultimately meant nothing, it doesn’t mean the Packers did not derive confidence (and likely a certain bulletproof mentality) in playing at University of Phoenix Stadium. The Cards also need to keep the crowd engaged. — Speaking of the crowd, will there be a chunk of Packer backers? Probably. But I have seen people concerned about 10,000, even 15,000. My thought is, so what? By my math, 63,000 (slightly less than capacity) minus 15,000 still equals 48,000 Cardinals fans. They will drown out any Packers contingent, as long as they have something to cheer for. — The Cards had five passes of 40 yards or more in the postseason last year. They had three the entire 2009 regular season. We’ll see if the offense can generate some big plays again – they’ll likely need it. — As everyone knows by now, three of the four playoff games this weekend are rematches of regular-season finales: Cardinals-Packers, Cowboys-Eagles, Jets-Bengals. The two NFC games will be played in the same stadium, a coincidence that has happened five previous times. In those five games, the home team won the playoff game three times. — Congrats to assistant head coach/offensive line coach/run game coordinator Russ Grimm (I love that title) for being one of the 15 finalists for the Pro Football Hall of Fame. Grimm has been here before and he downplays it every time, but one of these years, I think that decade he spent anchoring the “Hogs” offensive line in Washington will get him in. Former Cards cornerback Aeneas Williams didn’t make the cut this time around. Former Cards running back Emmitt Smith did – maybe on the strength of what he did elsewhere during his career – as did one-time coach Don Coryell. Coryell was the Cards’ coach the last time this franchise won 10 games in a season. — Also congrats to defensive lineman Darnell Dockett and Warner, each of whom capture the annual awards from the local chapter of the Pro Football Writers Association (sponsored by Oregano’s Pizza Bistros). Dockett was awarded the Lloyd Herberg MVP award, beating out Warner and Larry Fitzgerald. Warner was given the Steve Schoenfeld Good Guy, given to the player the writers deem most helpful to the media, beating out Fitzgerald, Campbell and Tim Hightower, among others. The awards are named after two former Cardinals/NFL writers for the Arizona Republic who each passed away while still covering the team: Herberg from cancer, Schoenfeld in a hit-and-run accident. — The Cards, I would think, need to run the ball Sunday some, to control the clock a bit and keep the Packers’ offense off the field. It is a unit that can put up points, and while the Cards always have been able to themselves, you get a feeling – even against Green Bay’s top-ranked run defense – the Cards have to find a way to make Beanie Wells and Hightower a factor. — It wouldn’t be bad if the Cards could somehow get to Aaron Rodgers like teams were getting to him earlier this year. This is when Dockett shines, under the spotlight. It’s time to see a heaping helping of 9-0. — There has been a sense all week the Cards not only have something up their sleeve, but they know a little something everyone else doesn’t. Whisenhunt has been eerily calm, in a good mood. As Warner said, this is the fun time of year, so maybe that’s just part of it. Personally, I’m just a little tired of talking Packers after two straight weeks. I’d like to be talking Saints or Vikings at this point next week.